By 1935, tensions ran high in Louisiana, as rumors of multiple plots to assassinate Huey Long swirled around the capital. Huey’s consolidation of personal power led to talk of armed insurrection by his enemies. 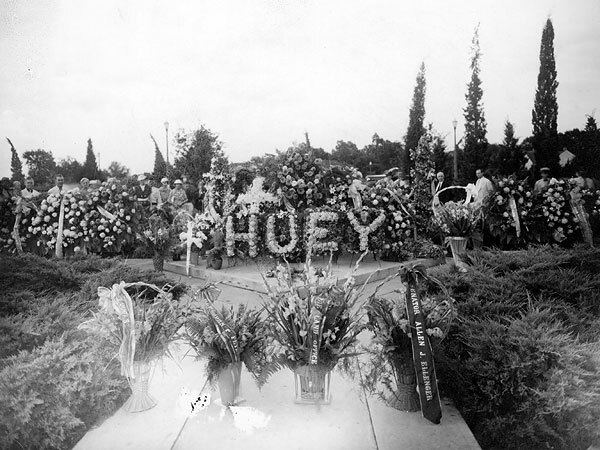 On September 8, Huey was shot by the relative of a political enemy in the State Capitol, and he died two days later at age 42. News of Huey’s death made headlines around the world, and an estimated 200,000 mourners flocked to Baton Rouge to pay their respects. After the election of Long ally Oscar K. Allen to the governorship in 1932, Huey continued to exercise de facto control of state government and made frequent trips to Baton Rouge to push his bills through the legislature. 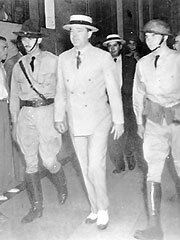 Huey Long surrounded by armed guards in the Louisiana State Capitol. After death threats, arson attempts, and a drive-by shooting at his New Orleans home, Huey beefed up his personal security, surrounding himself with armed bodyguards from the state police. Huey also worried about his family’s safety and was concerned that his children may be kidnapped. The threats only strengthened his resolve to crush his political opponents. Completely stymied by Long's political maneuvers and legislative victories, his enemies formed a paramilitary organization called the Square Deal Association to plot armed insurrection. The movement likened itself to the 1874 white supremacist uprising against the state’s Reconstruction government. 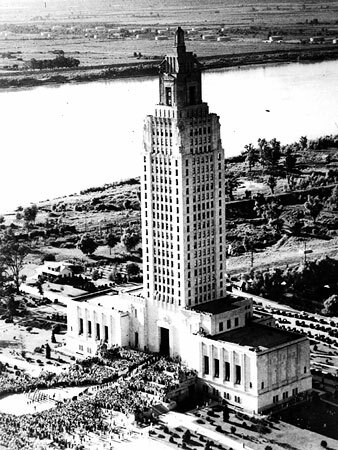 In January 1935, 200 armed Square Dealers stormed the East Baton Rouge Parish courthouse, prompting Governor Allen to call out the National Guard and declare martial law. In July, Huey declared that he had discovered an assassination plot against him. Long’s associates had eavesdropped on a secret meeting in New Orleans, which included four Louisiana congressmen, New Orleans Mayor Walmsley, and former Governors Parker and Sanders. Another man, identified as “Dr. Wise,” was introduced at the gathering. “I was very lucky in knowing and being a close friend with an old eccentric gentleman in Winnfield who as a young man, was invited to a secret meeting. He said at the time he had no idea what the meeting was about. He only knew the close friend who invited him was a well known doctor who was born and raised in Winn Parish and a person he trusted. After having met the man in Shreveport, he was blindfolded and taken to an unknown location where he had to take an oath on a Bible that he would not reveal what was going on. On September 8, Huey was in the State Capitol in Baton Rouge for a special session of the Louisiana legislature, pushing through a number of bills including a measure to gerrymander opponent Judge Benjamin Pavy out of his job. According to the generally accepted version of events, Pavy’s son-in-law, Dr. Carl Weiss, approached Huey in a corridor and shot him at close range in the abdomen. Huey’s bodyguards immediately opened fired on Weiss as Huey ran to safety. Weiss was killed instantly, and Huey was rushed to a nearby hospital, where emergency surgery failed to stop internal bleeding. 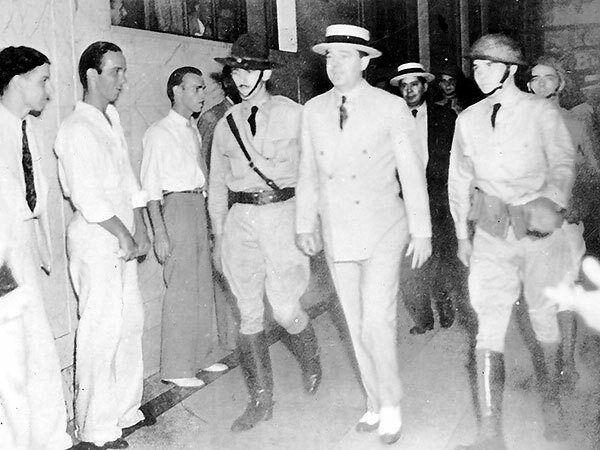 Four years after Huey Long's assassination, a wave of political corruption swept Louisiana during the administration of Governor Richard Leche in a dark episode known as "The Louisiana Scandals" … read more. Huey Long's defeat of aristocratic rule transformed Louisiana government into a true democracy and divided state politics into progressive and conservative factions identified as "pro-Long" and "anti-Long" — making Louisiana politics and government one of the most inclusive, participatory and colorful traditions in the United States … read more. 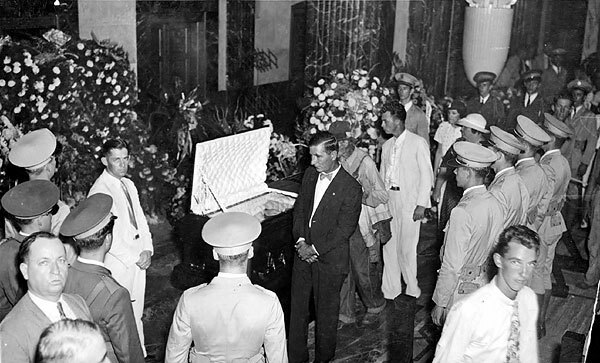 Mourners process by Huey Long's casket lying in state at the Louisiana State Capitol. More than 200,000 mourners attend Long's funeral at the State Capitol in Baton Rouge, La. 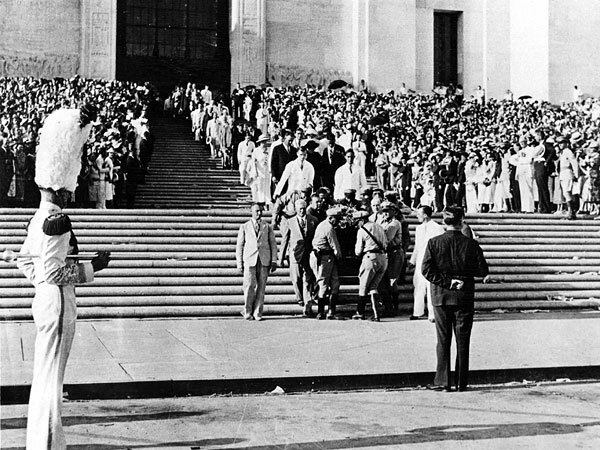 Long's casket is carried down the steps of the Lousiana State Capitol. The Rev. Gerald Smith stands ready to lead the procession to Long's interment on the grounds of the Capitol. Huey Long was buried on the grounds of the new State Capitol he built. More than 200,000 mourners traveled to Baton Rouge to honor the Kingfish — eight times the city's population. Share Our Wealth organizer Rev. Gerald Smith delivered Long’s eulogy. 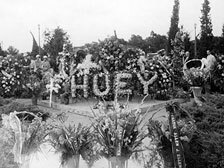 Huey’s widow, Rose, received thousands of condolence letters from across the country. She was appointed to fill Huey’s seat in the Senate and later elected to the position, making her the second woman elected to the U.S. Senate — behind Hattie Caraway of Arkansas. A large statue of Huey Long on the grounds of the Louisiana State Capitol depicts his achievements. He is also immortalized by a statue in the U.S. Capitol. 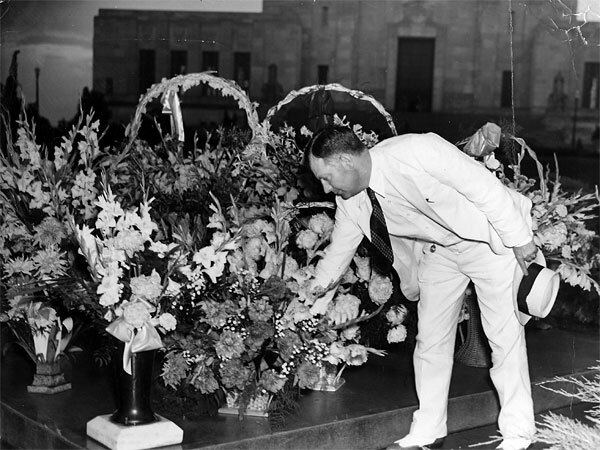 Huey's brother, Earl Long, lays flowers at Huey's gravesite on the Capitol grounds. Why Were the Surgeons Delayed? After Huey’s shooting, special trauma surgeons were summoned from New Orleans to perform his emergency surgery. They were not able to reach Baton Rouge in time, due to roadwork on the new Airline Highway, an 80-mile concrete road initiated by Long to link the two cities. Construction of the Bonnet Carré Spillway forced the surgeons to take the old River Road, where they had a car accident. Long's family traveled the new highway anyway, his two teenage sons removing barricades as they raced in the middle of the night from New Orleans to Baton Rouge. 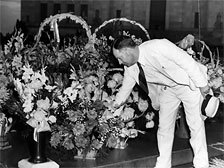 Flowers at Long's gravesite on the anniversary of his death, before his statue was erected.